If the Italian company Jet Capsule has its way, homeowners of the future will be moving into UFOs—just not the kind that fly through space. As reported by Popular Science, Jet Capsule's "Unidentified Floating Objects" are designed for life on the ocean's surface. 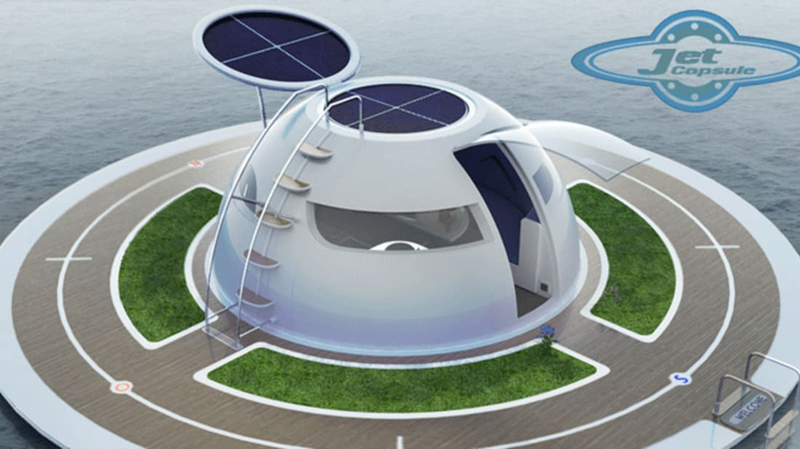 The recently unveiled housing concept consists of a 40-foot, saucer-like platform with a spherical cabin at its center. The upper half of the bubble serves as the kitchen, living room, and dining room, and the lower half contains a bedroom and bathroom with a wrap-around window offering views of the underwater scenery. To power the home, turbines attached to the UFO would harvest wind and water energy while solar panels would collect energy from the sun. And if residents ever felt like moving, an electrically charged, hydrojet engine could take them to their next destination. The people at Jet Capsule are no strangers to designing futuristic inventions for the sea. Their Jet Reptile, Jet Taxi, and signature Jet Capsule aquatic vehicles would all look right at home in a James Bond movie. And as rising sea levels threaten to erase coastal cities, now's an opportune time to break into the floating housing market. Images courtesy of Jet Capsule.